Disclosure: The stand mixer attachments mentioned in this post were provided free by KitchenAid Canada. I was not otherwise compensated for this post, and opinions are entirely my own. I live near some awesome families. Seriously, they're a fun bunch. Between the road hockey games, back yard movie nights and dinner parties we've got a really good thing going on. And not just for the kids. 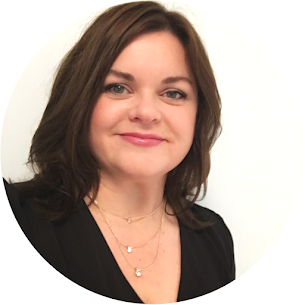 The moms on the block have become pretty close over the last few years, spending time in each other's homes, going for walks and bike rides for a little mom time without the kids. We even have a book club-style documentary movie night we call 'Hot Doc Night' that we take turns hosting in our living rooms. So, when KitchenAid Canada said they'd ship out their pasta attachments so I could host a pasta making party with the moms on my block, I was thrilled at the company's generosity and excited to set a party date. I had been wanting to try making pasta with my stand mixer for some time, but I had never made the leap. As with a lot of new adventures in the kitchen, sometimes a lack of knowledge and experience is the biggest hurdle. There was a lot I didn't know. Most notably, I didn't know KitchenAid actually has THREE different pasta attachments. Seriously, I thought there was only one. I didn't know the attachments are actually made in Italy either. Mamma Mia, authentic or what? 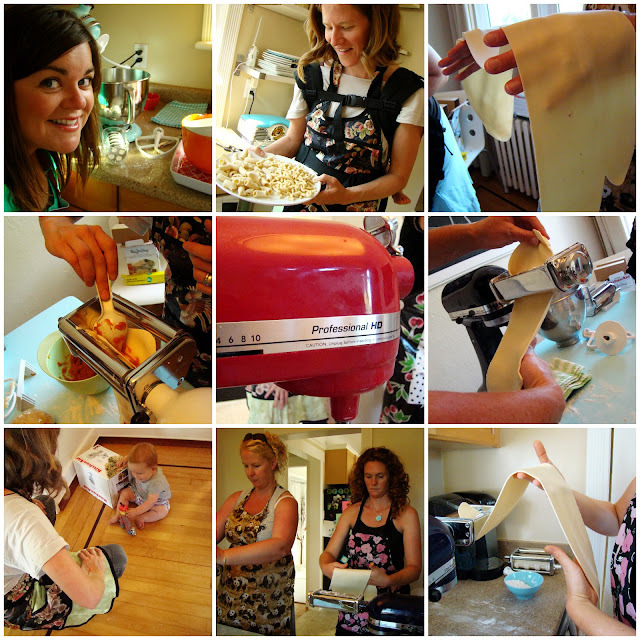 But by the time Alison, Erin, Jen, Mercedes and I gathered around my dining room table with our stand mixers, I had practiced a couple times with pasta making and had enough beginner knowledge to get us all started. We tried all three pasta attachments within a couple hours, making pasta sheets, fettuccini, spaghetti, ravioli, and a few different small shapes. I know how sometimes it feels like my kids are on my back to make macaroni. Well, my neighbour Jen literally had her kid on her back while making macaroni! Multi-tasking Jen didn't miss a beat when our youngest pasta partier got a little cranky, slipping her into a baby carrier so she could keep working with the dough. And if that's not cute enough, with the white noise of all the stand mixers going at once, her little one quickly nodded off for a bit of a mid-party snooze. The 3-piece pasta roller and cutter set. This attachment is probably the most versatile of the three. It has three rollers; one for rolling pasta sheets, one for cutting spaghetti and one for cutting fettuccini. The sheets can be used for making lasagna, free-handing filled pastas like ravioli and tortellini, and making sheets for the ravioli attachment (sold separately). 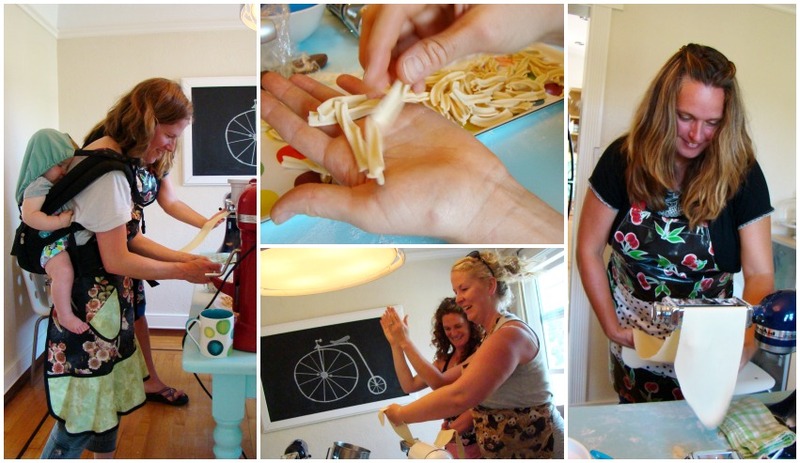 Making the long sheets of pasta by repeatedly folding the dough and running it through the rollers was a lot of fun. Seeing little pouches of pumpkin sage-filled ravioli coming out of this attachment made Alison say, "This is SO satisfying!" While the ravioli were a little tricky to separate, we had lots of fun with this one and enjoyed coming up with different filling ideas. 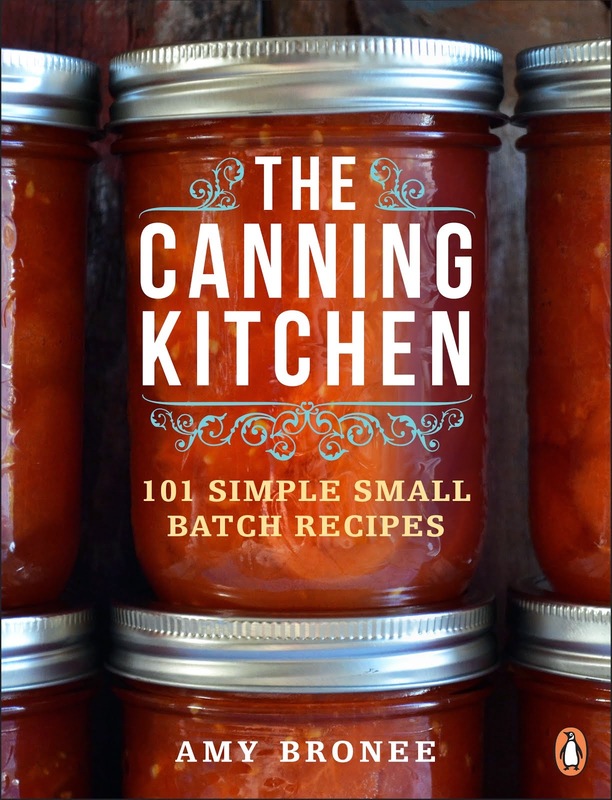 There's even talk of having a ravioli night in the future where we'd each bring some dough and a different filling, then split the results of our little pasta factory to bring home to our own freezers. This was Jen's favourite. It dawned on us that small shapes of fresh pasta tossed with vegetable puree would make an ideal baby/toddler finger food. 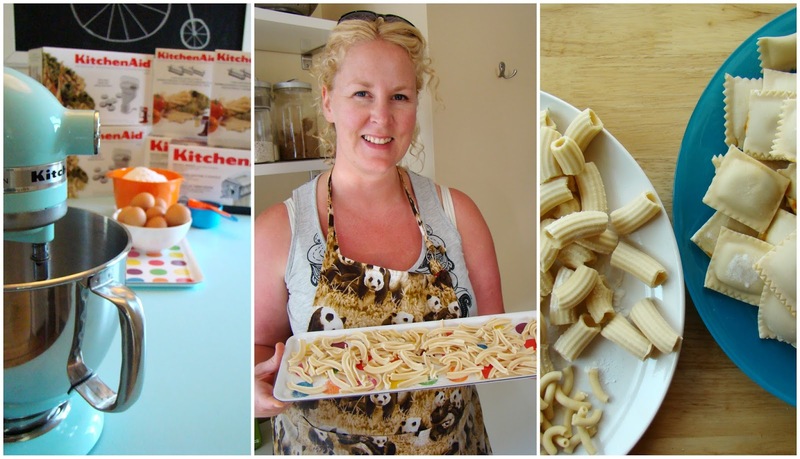 By keeping a stock of pasta shapes in her freezer, she can take out a handful at a time and have a dish put together in minutes. We tried the rigatoni plate, the macaroni plate and the fusilli plate. I think the macaroni shapes that Jen made looked even better than the ones on the box. Yes, that's my clothes drying rack being used to dry our long pasta. It works great. I have a friend that uses clothes hangers in her kitchen for drying pasta. Brilliant. I love simple solutions and multi-purpose ideas. A big thank you to KitchenAid Canada for providing all the attachments. I hear the pasta we made was a hit with the families on our block, and I think we're all feeling inspired. I know I'll be experimenting a lot more with homemade pasta now. Do you have any of the KitchenAid pasta attachments? What about the other stand mixer attachments? I'd love to know which ones are the best! Leave a comment and share your tips and ideas for making fresh pasta. It was such a fun afternoon! 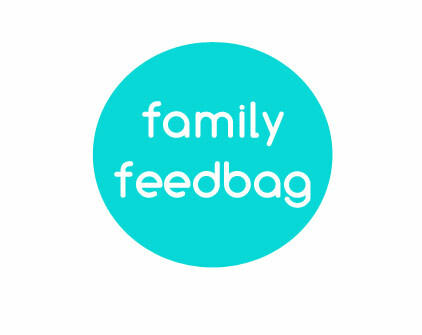 I feel very lucy to be a part of the Family Feedbag "family"! You have the best ideas. Thanks for thinking of such a fun one! That sounds like so much fun! A couple of questions. Did you use the pasta recipe from the kitchen aid booklet that came with the rollers? If not, would you share what you used? As well, you mentioned freezing the pasta. Do you just freeze the dried pasta? Thanks for the info! We have been making our own pasta and are finally getting the hang of it. And it tastes so good! 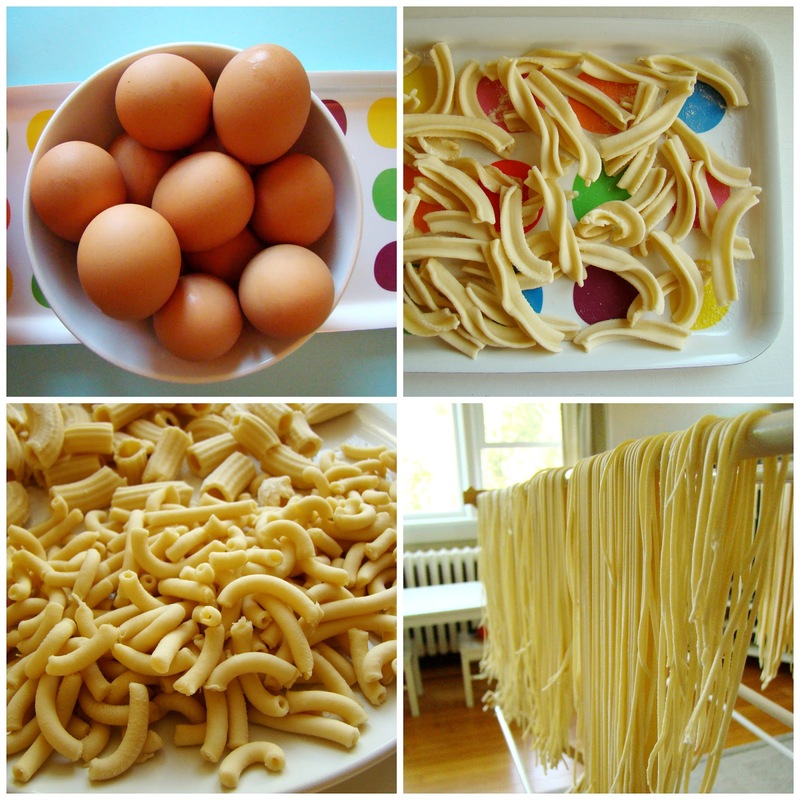 We did use the basic egg pasta recipe that comes in the booklet. In all, I've made it three times and The Moms made it twice more, and every time we needed to add more water than the recipe calls for (it calls for 1 tbsp and we needed to add up to 4 tbsp). My advice is trust your great home cook's instincts and if it feels dry add half a tablespoon more at a time until the dough is in clumps with no fine flour dust left in the bottom of your mixer bowl. The clumps were brought together by hand into a ball, then we switched to the dough hook for kneading. Because the pasta is made of eggs you need to get it in the freezer (or fridge, if you're going to cook it later the same day) within an hour. It starts to dry pretty quickly, but if it's still a little tacky after an hour I just pop it in freezer bags and get them in the freezer. The frozen pasta cooks in boiling water in just a few minutes. I hope that helps! KitchenAid has a lot of great info in the booklets that come with the attachments too. Looks like so much fun! I want to move to your block! I want you to move to my block too. Just imagine the adventures we'd get up to!